Learn how to start your own company! With the range of all! This handbook wants to be simply a practical tool for all those and those which wish to start a company in the cleaning of carpet and pieces of furniture of all kinds. It contains information based on a professional experiment acquired with the passing of years. The information contained in this ebook can also apply in all or partly to any kind of work at home business. Several will find there ideas that they will be able to put into practice in their own company. This manual reveals all the secrets to start a carpet and furniture cleaning company! Examine Contents and see the importance of the covered subjects and the multitude of information which it contains. It is a complete and extremely useful handbook for any contractor who wishes to launch out in businesses in the field of carpet and furniture cleaning. and obtain 4 other FREE electronic books. Benefit from this occasion! Offer you the tool which you need to help you to pass to the action. It is easy, simple and functional. An electronic book dealing with the various ways of making a follow-up of its customers using an automated responder and offering some examples of letters which we can use in various companies. Learn how to place your Web page on the autopilot. A quick and easy way to electronically publish your work within minutes. In the pages that follow, you will learn about some of the pros of ebook compilers and ebook publishing companies. 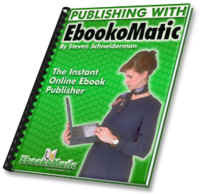 The Instant Online Ebook Publisher is the only reasonable choice for you to consider. Learn how to publish your own ebook on Internet. This series will lead you the beginner user of Internet at the accomplished user of Internet, starting from a series of progressive stages, so easy to understand, that you would not have thought it possible. Hopkins was indisputably the greatest advertising genious of the 20th century, and its brilliant and innovating ideas on marketing changed the face of publicity and the edition for always. By Claude C Hopkins with a foreword, articles and additional tutoriels of Joe Robson.